The Journal publishes manuscripts relevant to diseases of the skin in a broad sense, with the aims of advancing scientific knowledge regarding dermatopathology and enhancing the communication between clinical practitioners and research scientists. 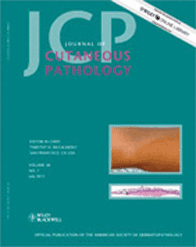 The monthly Journal of Cutaneous Pathology is available to all ASDP members. Members of the ASDP may access the Journal of Cutaneous Pathology online with their membership. The ASDP Interactive Case Study of the Month features a zoomable virtual slide. iOS users: The Virtual Slide is not currently supported in the iOS environment. ASDP has been granted Accreditation with Commendation from the Accreditation Council for Continuing Medical Education (ACCME). ASDP’s new accreditation term is valid until Nov. 30, 2020. Read more.